There's a special place just waiting for you to visit. Where cows, pigs and horses are your best friends. Where songs and stories are full of wonder. Where every day is an adventure. Where fun and learning never end. Where? It's New Macdonald's Farm! 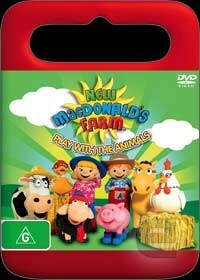 Once again, it's time for parents around Australia to relax as they slide Play With the Animals into their DVD players that will give kids hours and hours of entertainment with singing, dancing and discovering everything that happens on the farm. Great stuff Roadshow! Presented in an aspect ratio of 16:9 widescreen with Dolby Digital 2.0 stereo that is simply amazing on those high definition TVs. Unfortunately no extras are included on this DVD.